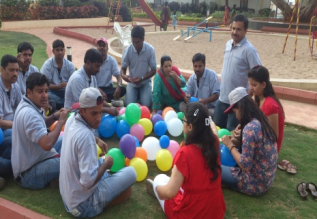 Conducting team building activities based on experiential learning platform can spark change in the motivation and performance of employees. 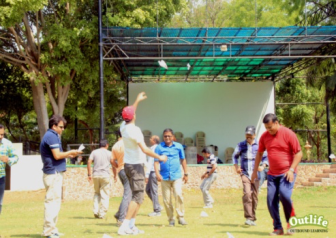 ​Such team building programs can be successfully conducted depending upon the learning objectives, desired outcomes and achieving them through a process of reflection and debriefing. ​The Learning begins with the experience followed by reflection, discussion, analysis and evaluation of the experience and transfer of the learning to workplace settings. 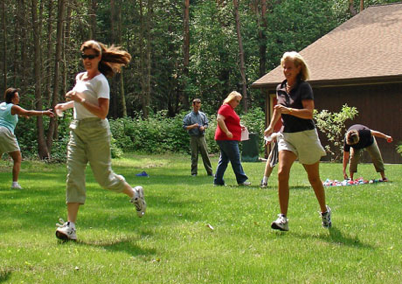 Outlife has been a pioneer for innovation in the field of team building programs using experiential education methodology making them hands on, engaging, fun and insightful. Methodology: Four hula hoops are arranged in four corners of an imaginary 25 square feet square and one in the middle of the square. Each hoop contains a tennis ball placed at the middle of the hoop. Four teams are formed. Each team chooses a hula hoop and stands beside it. The focus of each team is to try and place all the tennis balls in the hoop. The team which has all the balls wins the game. There should be no throwing or tossing of the balls. Methodology: A magic cane, also known as the helium stick is given to participants. A group is split into two facing each other. The participants need to point their index finger in front of them. The helium stick is laid down on the top of their index fingers. The stick is kept horizontal by adjusting the heights of the fingers. All the index fingers should touch the stick. The challenge is to lower the helium stick to the ground. Pinching or grabbing the stick is not permitted. If anyone’s finger is not touching the helium stick, the challenge is restarted. Learning Objective/Outcome: Communication skills, cooperation, patience, and working together to achieve a team goal. Methodology: Sitting on the floor, a group attempts to pass a large jug around the circle using only their feet in as few 'falls' as possible. The activity is timed and whichever team does it quicker and with less number of drops wins. The Facilitator adds complexity enabling problem solving and teamwork. Learning Objectives/Outcomes: Fun problem-solving exercise, develops teamwork, focuses on goal-setting, and develops cooperation. Methodology:Participants will be dropped to an unknown location close by to the resort with a Map and Compass and few instructions. They have to make it to the resort using the Map and with support from each other. They also need to find a treasure box and get it along. 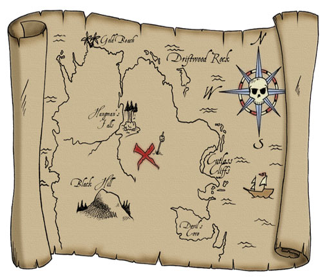 A treasure Map with Clues will be given to locate the treasure Box. Learning Objectives/ Outcomes: Team work, Communication, Decision Making, Trust Leadership, Achievement. Methodology: Teams use poles to build the ‘A’ Frame. Once constructed members of the team must then volunteer to stand in the ‘A’ Frame whilst the other members co-ordinate a ‘walking’ pattern to get the ‘A’ Frame to its target. Success in this task covers a number of areas including construction, co-ordination, trust and physical ability. 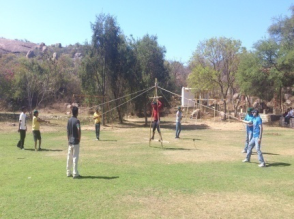 Methodology:Team members have to get through a spiders web, without touching the web, and using each hole only once. 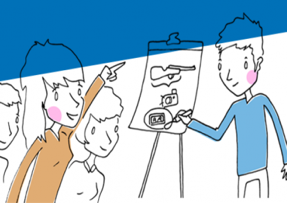 ​It requires your group to work at a slightly higher level of cooperation. Methodology: Employees are divided into two teams. A Pictionary card is drawn and a word is chosen. A player from Team A is given 2 minutes time to draw while their team mates try to guess the word. The team mates can shout while one of them draws the pictures. Team A gets one more chance to guess while time is run out. If they cannot answer, then Team B gets the chance. Accordingly the teams are switched with each other and Team B gets the chance to draw. Methodology:Participants are divided into two groups of 5 to 6 per group. Each group is given 10 A$ size sheets both of different colors. ​A masking tape is used to create a start and a finish line. Each team gets 3 minutes time for strategic planning without paper. Then the team gets 5 minutes time to build their airplanes and get them across the taped line. The winning team will get the most paper airplanes across the taped lines. Methodology: The participants needs 45 minutes time to plan, design, create and market their Ballooniture game. The participants need to create the ballooniture in such a way that it can be practically used; it can also hold a team member for a full count of 10 seconds. Learning Objectives/ Outcomes: Leadership Development, Task delegation, Calculated risk taking, Agreement to decision making within team, Accountability of actions within the Leadership Team.